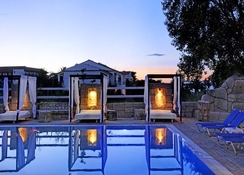 Island Beach Resort is a luxury adults-only hotel situated in Kavos, Corfu in Greece. The hotel has its own private beach with a beautiful, large swimming pool. The onsite 18-hole golf course is one of the major attractions of the property. 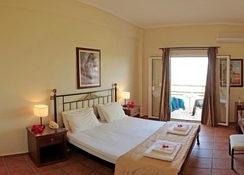 The hotel has 35 well-decorated rooms with all the essential amenities. The hotel serves as venue for several major international concerts like ‘Sandstorm’. The guests can relax near the swimming pool, surrounded by tall palm trees, on the loungers spread around the pristine pool. The hotel houses a restaurant and bar that serve international and local Greek cuisines along with local wines and signature cocktails. The eateries are set along the beach, giving the guests an enviable view of the Ionian Sea during meals. 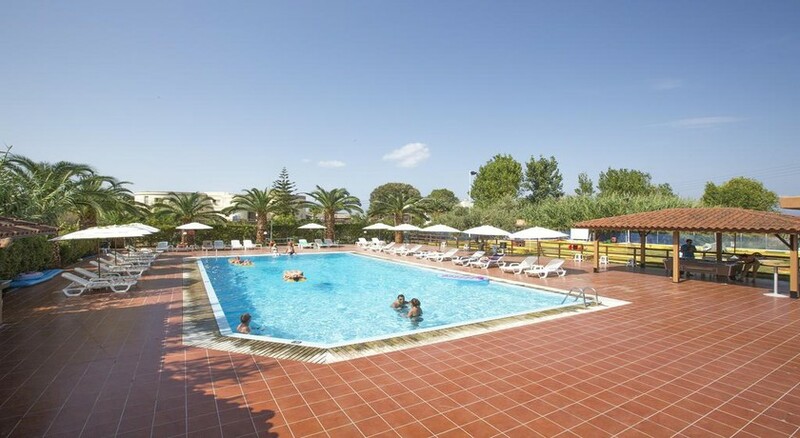 Island Beach Resort is located 45.4km away from the Corfu International Airport and 106km from the Ioannina Airport. The closest beach is 100m away from the property. The scenic Korission Lake is 24km away from the hotel. The town of Kavos is at a walkable distance of 400m. The Corfu town is 58km away from the hotel. On special request, the hotel management can arrange rental cars for their guests’ local excursions. Airport pick-up and drop off can also be arranged at an additional cost. The Island Beach Resort has 35 well-designed guest rooms. 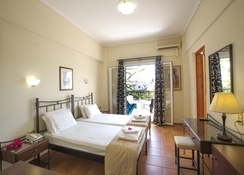 The rooms are categorised into 6 types based on size, amenities and number of occupants. Superior, Island Sky Superior Room for 2 persons, Island Sky Superior Room for 3 persons, Island Sky Superior Room for 4 persons, Superior Self Catering 2 persons, Superior Self Catering 3 persons, Superior Room Only for 2 persons, Superior Room Only for 3 persons and the Superior Room Only for 4 persons are the type of accommodation options at the resort. All the rooms are equipped with amenities like air conditioning, kitchenette, television, telephone, free Wi-Fi, linens, etc. The bathrooms are also stocked with bath linens and essential toiletries. The Island Beach Resort houses a restaurant that serves a wide array of dishes from local Greek and international cuisines. The hotel serves breakfast buffet, lunch and dinner. The hotel also houses a bar that serves local wines and cocktails. 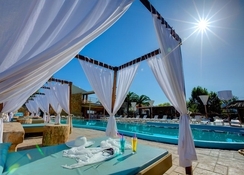 The beach club – Bamboo is a local night-life hotspot in the town of Kavos. It is open on all days and serves a variety of alcoholic drinks. The club is quite popular among locals as well as tourist for the kind of vibe it offers. Tourist can also visit Kavos, which is just 400m away from the hotel and try local restaurants, bars and traditional taverns. The Island Beach Resort is quite popular in Kavos for being a party hotspot. The resort serves as a venue for major international concerts like ‘Standstorm’. The hotel also has its very own private beach where the guests can indulge in beach sports. Apart from that, the on-site Bamboo night-club, which is quite popular among the locals, also makes for perfect evenings. The club has an in-house DJ who performs on all days. The guests can also enjoy indoor games like billiards, etc. The major attraction of the hotel is its 18-hole mini golf course, where the guests can indulge in some golfing. The guests looking to explore the local lifestyle of Greece can visit the town of Kavos.